When you think of Outlook you might think of a stuffy, old-fashioned email client for Windows, but we’re here to tell you that in 2019 it’s also a very good calendar and task management app for mobile, even if you don’t plug your email accounts into it (if you decide do that as well, you can more easily add events from your inbox, and so on). Some serious effort has gone into the design of Outlook for Android and iOS, with event pages showing locations, attendees, and all the other key information in a refreshingly simple and smart way. Even when you’ve got a whole mass of days and appointments on screen, Outlook manages to help you make sense of it with good use of grids and colors. Outlook is geared up to import calendars (and email accounts) from just about anywhere, so you don’t have to do a full dive into the Microsoft ecosystem to get the Outlook calendar app up and running on your phone. It comes with a ton of integrations with other services as well, from Dropbox to Evernote, so you can easily make it the center of your digital life. 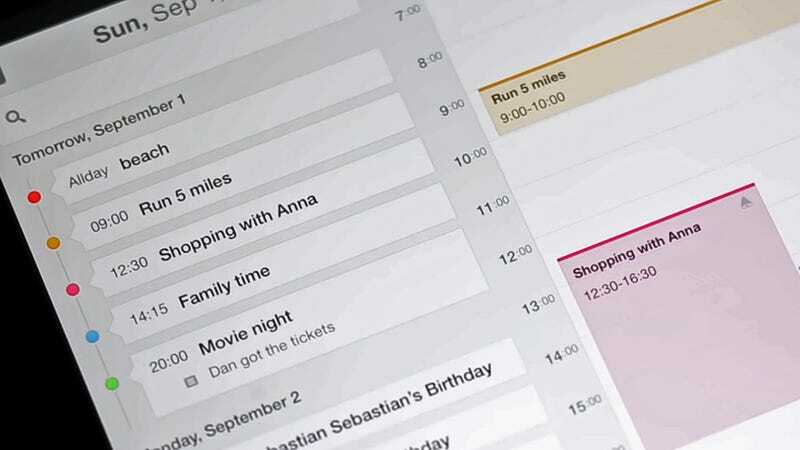 Fantastical usually appears on lists of best calendar apps, and with good reason: It’s hard to imagine a calendar-related feature that it’s missing, and it rolls everything together in a sharp layout that cuts through the scheduling noise. Just about our only gripe about the Fantastical app is it’s not available for Android, so this is one just for those of you on iOS. Alongside all the basics you would expect, Fantastical includes some genuinely innovative features, like the natural language interface that lets you create reminders or calendar events just as you would when talking to a friend. Color coding and typography are put to good use as well, from the overall calendar view to the individual appointment pages. The DayTicker feature gives you a refreshingly simple overview of what you need to do on any particular day, while there are also very useful integrations with the likes of WhatsApp (for sending event reminders to guests) and Google and Apple calendars (for importing events from other platforms). Definitely worth the $2 admission for the iPhone or iPad. As for Android-only calendar apps, CloudCal is hands down one of the very best we’ve come across. It may lack some of the aesthetic appeal of the other calendar apps covered in this list, but there’s no doubting the number of features packed in here—CloudCal includes everything you would expect from a mobile calendar app and then some. Take the at-a-glance layout of circles that shows you instantly how busy you are on each day of the month, or the simple swipe mechanisms you can use to jump between calendar views. This being Android you have got a choice of home screen widgets to pick from as well, making it easier than ever to check on your upcoming calendar schedule. You get reminders, reminder snoozing, syncing with Outlook and Google Calendar, and even integration with Uber for getting to your next meeting. A premium account ($3.50/month) gets you all the features we’ve already mentioned plus more third-party plug-ins (like Evernote and Dropbox), location reminders, and some other goodies. The very appropriately named Calendars is another iOS-only app—sorry, Android users—but is absolutely worth a mention for its elegant user interface and the way it manages to cram several days of information into a layout that isn’t at all confusing. As with several other calendar apps, it includes task management and reminders too. From the drag-and-drop option for moving events around your planner, to the natural language voice input support, Calendars continually impresses down to the smallest of details. You can plug in an Apple calendar or a Google calendar as the basis of your schedule in Calendars, or you can start from scratch again when you’ve installed the app. It works offline and online too, which is a feature that not all calendar apps can offer, and can be accessed directly by Siri. Once you’ve started using the app, it’s only free for seven days, after which you need to cough up $1/month for a subscription—but considering a lifetime unlock fee is only $9, you might well consider buying that if like it. Any.do has a clean and clear interface that seems to us to mix in the best bits of Apple Calendar and Google Calendar and then build on them. The sharp typography, the subtle color coding, the careful use of icons, widgets that don’t look overly cluttered (a real rarity in our experience)... it all adds up to an impressive calendar app that’s worth a look. In fact Any.do is much more than just a calendar app, incorporating to do lists and reminders as well as the regular scheduling functions. You can share notes with other people, add attachments to your calendar entries, create events with invites for your contacts, and even sync everything with existing Google or Apple calendars, if required. Where the app really excels is in bringing all this information and data together in a form that’s easy on the eye and easy to understand. Most of the features are free to use, but a premium ($6/month) account gives you access to themes, location-based reminders, custom recurring tasks, and more.